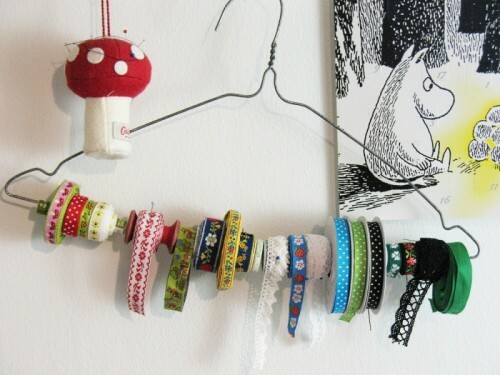 If you’re into crafts then you probably have several ribbons lying around. You can make a nice tabletop or wall organizer for them but that will take some time. If you want to spend time on real project instead you still can organize them very well. You just need a simple dress-hanger. If you cut off its middle, place your ribbon spools on it and fix it back with some duct tape you’ll get a nice ribbon organizer. You can hang it on some of your shelves or walls. It takes several minutes to make it, so why not?